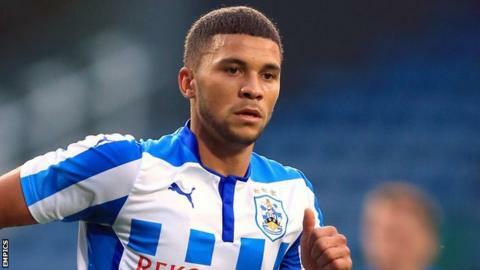 Nahki Wells scored a late winner as Huddersfield fought back to end Bolton's eight-match unbeaten run. Darren Pratley gave the visitors the lead after 41 seconds, crashing the ball home off the underside of the crossbar from the edge of the area. Keeper Andy Lonergan made a series of saves before Jacob Butterfield levelled with a half-volley. Substitute Wells then coolly finished under Lonergan after Emile Heskey had a Bolton effort ruled out for offside. Former England striker Heskey was again used as a substitute after scoring on his debut for the Trotters on Boxing Day, but his introduction could not stop Bolton slipping to a first defeat since 31 October. Huddersfield's first victory in four matches sees them move up to 18th in the Championship table, while Bolton drop one spot to 15th. Trotters midfielder Pratley punished the Terriers for their inability to decisively clear the danger from an early free-kick, calmly bringing the ball down on his chest before giving Bolton the ideal start with a thumping finish. Butterfield went close to hitting back soon after, testing Lonergan from close range, while James Vaughan and Harry Bunn also called the visiting keeper into action. Alex Smithies kept Eidur Gudjohnsen out at the other end before Jonathan Hogg found Butterfield in space to rifle in a deserved equaliser. Butterfield continued to trouble Bolton and had a weak follow-up shot scrambled away by Lonergan after the keeper had kept Vaughan at bay. Heskey looked to have put Bolton 2-1 up but, after poking the ball past Smithies, his effort was ruled out for offside. Lonergan tipped a Jack Robinson shot over the bar before Wells won it with a low finish after racing on to a Hogg through ball. Huddersfield manager Chris Powell: "Nahki will get games and will score goals. He is an important player. He might not think that when he doesn't start but I know 100% what he is capable of. "We have to make sure we have the platform for him to play and score goals." Bolton manager Neil Lennon: "We have been done by two refereeing decisions. Heskey was clearly on side - he was at least level with Jack Robinson - and the second goal was hand ball by Hogg. "To be fair to Huddersfield, they had a very good spell in the first half and really forced the game." Match ends, Huddersfield Town 2, Bolton Wanderers 1. Second Half ends, Huddersfield Town 2, Bolton Wanderers 1. Offside, Bolton Wanderers. Emile Heskey tries a through ball, but Matt Mills is caught offside. Attempt blocked. Robert Hall (Bolton Wanderers) left footed shot from outside the box is blocked. Assisted by Neil Danns. Robert Hall (Bolton Wanderers) wins a free kick in the attacking half. Substitution, Huddersfield Town. Anthony Gerrard replaces Jacob Butterfield. Substitution, Bolton Wanderers. David Wheater replaces Liam Trotter. Lee Chung-Yong (Bolton Wanderers) is shown the yellow card. Goal! Huddersfield Town 2, Bolton Wanderers 1. Nahki Wells (Huddersfield Town) left footed shot from the centre of the box to the bottom left corner. Assisted by Jonathan Hogg with a through ball. Substitution, Huddersfield Town. Adam Hammill replaces James Vaughan. Offside, Bolton Wanderers. Liam Trotter tries a through ball, but Robert Hall is caught offside. Offside, Huddersfield Town. Conor Coady tries a through ball, but James Vaughan is caught offside. Attempt saved. Jack Robinson (Huddersfield Town) left footed shot from outside the box is saved in the top centre of the goal. Assisted by Jonathan Hogg. Substitution, Bolton Wanderers. Robert Hall replaces Eidur Gudjohnsen. Offside, Bolton Wanderers. Neil Danns tries a through ball, but Emile Heskey is caught offside. Attempt blocked. Lee Chung-Yong (Bolton Wanderers) right footed shot from the centre of the box is blocked. Substitution, Huddersfield Town. Nahki Wells replaces Harry Bunn. Attempt blocked. Sean Scannell (Huddersfield Town) left footed shot from outside the box is blocked. Offside, Bolton Wanderers. Lee Chung-Yong tries a through ball, but Emile Heskey is caught offside. Attempt missed. James Vaughan (Huddersfield Town) header from the centre of the box is too high. Corner, Bolton Wanderers. Conceded by Murray Wallace. Foul by Jack Robinson (Huddersfield Town). Substitution, Bolton Wanderers. Emile Heskey replaces Darren Pratley. Offside, Huddersfield Town. Jonathan Hogg tries a through ball, but Sean Scannell is caught offside.